I was raised on a small island outside of Bergen, Norway. I knew at a very early age what I wanted to do and what I wanted to become. By the time I was five years old, I wanted to be captain of a ship, though I wasn’t necessarily thinking of a cruise ship. I just wanted to be at sea. My inspiration was my dad, who told me stories about times my grandpa went to America and crossed the Atlantic on ocean liners. I loved those stories of how the ship encountered storms, and how my grandpa got to meet the captain…so my very young mind was just filled with images of grandpa sailing across the Atlantic. Back then, as a little boy, the ocean was something that was mysterious and seemed dangerous, you know, being out there on the ocean and not being able to see land. My mom said the first drawing I ever drew was of boats and ships…and during arts and crafts, all I did was make wooden boat models. 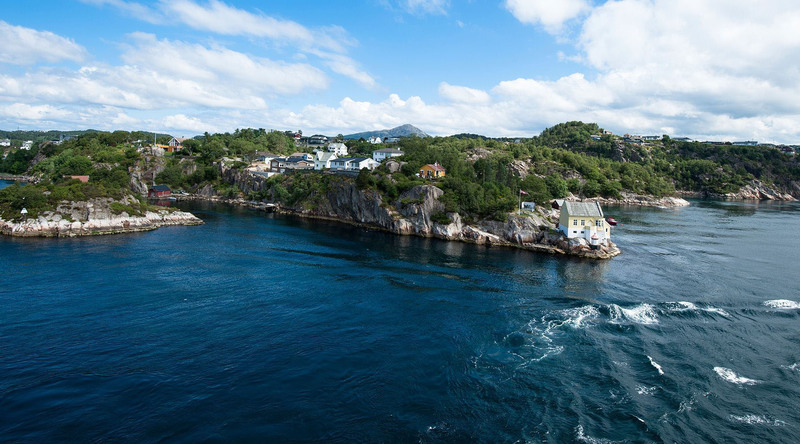 Living on an island, we’d go to Bergen on the ferry. (Our island wasn’t connected by a bridge until the late 1990s.) If my dad knew the skippers on the ferries, I wouldn’t leave him alone unless he took me to the bridge. For me, getting up there with the skipper was like walking on Cloud 9. I hear the same thing over and over. The number-one comment from guests is about the crew, how they love their friendliness, their smiles, their attitudes and how well they work with each other. Many guests have sailed with our competitors, and they say the crew really makes a difference. And they like the visibility of Azamara officers onboard our ships compared to many other cruise ships out there. In terms of requests, another thing I hear a lot is that guests want us to sail the waters of Australia and New Zealand. Every time we have a Q&A we get asked that. It’s a nonstop repeat request. I tell our guests if you want that, just book another cruise, and another one after that, and pretty soon we’ll get another ship and get you there. The sooner you book another cruise, the sooner we’ll be in Australia! The year before last, Sir Roger Moore—the Roger Moore of James Bond fame—was on board with his wife. His wife is Swedish and he commented on how she loved brown cheese and goat cheese. In fact a number of guests were asking about Norwegian goat cheese. So I got the idea after we left Flåm on the Norwegian coast to stop at a little village known for its goat cheese production. The entire village has 100 inhabitants and 500 goats, along with the smallest church in Scandinavia, with 40 seats. I asked the Hotel Director, Heike, if she had money to buy some cheese. So the executive chef and the safety officer went ashore with the rescue boat and bought 12 pounds of goat cheese and some smoked lamb sausage. When they came out of the store and held up the bags, all the guests watching from the ship were clapping and cheering from the decks and balconies. We served it for breakfast the next morning at the buffet, and it was all gone in a couple of hours. A couple of days later it was on the front page of the regional newspaper in the Sognefjord: Cruise ship stops to buy goat cheese. On that same trip we stopped to buy fresh seafood. We left Bergen at 6:30 in the evening. An uncle of mine had a cabin a few hours north of Bergen. So I knew there were local fishermen on the island, and asked my uncle if he know any who could deliver fresh seafood and crabs. I got in touch with one of them and he came out with his fishing boat, we stopped in the middle of the fjord and loaded up with fresh salmon, codfish, and 350 live stone crabs and live langoustine. So the chef made a special appetizer out of the stone crab claws and specialty dish out of the langoustine. Again, that’s something guests come back and talk about. Being able to do special things like that…it leaves memories, and our guests go home and share the Azamara experience with friends and family. And compared to many other cruise ships, these experiences are unique. Last year we were at Seven Sisters waterfall in the Geirangerfjord. Other cruise ships just go by at cruising speed while heading for the next port. We stopped for half an hour, then did a 360-degree turn so guests on all sides could get a look. Being with a small cruise line like we are, and having a CEO like Larry Pimentel who gives us a bit of freedom, we are able to do things like this. When we see special opportunities we plan accordingly with our home office and local authorities to make them happen. And there’s spontaneous fun onboard, too. One night I walked through the specialty restaurants and a guest made a joke about “How come I don’t get to see the sunset on this side?” So when I finished greeting guests and got back to the bridge, I made an announcement that all guests should see the sunset, then did a slow 360 degree turn so they did. They still come back and talk about that. And for the rest of the voyage I had guests coming up and saying, I’ve been on 35, 50 or 70 cruises and never had anything like this happen. Our guests love these personal touches. I came here three years ago as captain, straight from the outside, and as one way of communicating my leadership style I started sending out daily quotes—they could be inspirational, funny or uplifting. I had a set of 29 quotes, and had managers print them and post them. I heard back from a number of people, “I love your quotes,” and thought, well then, I’ll do some more. So I came back onboard after my first vacation and asked the crew to send me their favorite quotes, too. I tagged their names to them when I posted them. So that’s been my thing. Once a year I repeat the 29 that I first sent out. Here’s one of my favorites: Leaders don’t create followers, they create more leaders. To me it means if someone does a good job you don’t take the credit, and you don’t shy away from blame when things go wrong. Basically put your people out there and give them credit for a job well done, and don’t get down on them when something goes wrong. Lessons learned are important; instead of an “I did” or “You did” culture, we work as a team.